West Coast Roundtable: Will we see Unicorns dying, or are we still in the early stages of a technology boom? Record figures in Silicon Valley: $ 9.3 billion went to Silicon Valley based start-ups just in the last quarter. 74 start-ups are valued at over one billion dollars (and called "unicorns"); Uber, for example, is now valued at $50bn. Private investors are lining up to hand out checks, while the companies – contrary to the dotcom era – opt to stay private, enjoying less regulation and more freedom. But pessimists fear a scenario where dying unicorns could tear holes in the balance sheets of venture capital companies, causing a chain reaction. VC firms' yield will go down, affecting their ability to raise money, and start-ups may end up falling like dominoes once the assets aren't going any more their way. Along with the tremendous wealth creation in the Bay area, there has also been a boom in West Coast wealth managers that have concentrated their client base in the tech industry, and also concentrated their clients’ assets in the tech industry, potentially putting their clients at a higher risk. But even skeptics of the current boom say that the situation is different from 2000 when many companies were already public and the collapse hurt a plethora of small investors and pension funds. This time, a large proportion of highly rated U.S. companies are not public. A potential setback would therefore hit start-up employees and a limited number of investors. Meanwhile, James Alpha Management believes we are still in the early stages of a technology boom comparable to the late 1990s which they believe will peak by 2020, but you are also advised to be invested in technology now to be able to ride the wave. Early stage venture capital would also reward investors handsomely between now and 2020, but if you wait another year or two, you could be too late. The tough part of this proposition is that it is very difficult to predict which apps and which companies will win or lose, so you have to find a manager who is both astute and has exposure which is diversified enough to benefit, but not so diversified that returns suffer and just mirror the indices. What are the criteria and process of the University of California, a $95bn institution, to select external managers? Given the levels of the equity markets, are investors dialing up alternatives in 2015, including tail risk strategies? How does James Alpha Management, a single family office specializing in seeding and growing alternative investment managers, identify start up managers to work with? What are the benefits of being based in the San Francisco Bay area? What are the best ways to compound capital today? How does a CTA with a 36 year track record navigate and succeed in today's environment? Has a manager's size become a proxy for quality, safety, and skill? Rightly so? Is the investor base bifurcating with only a minority allocating to smaller managers? 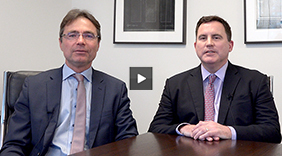 What are the risks of co-investments that sometimes investors tend to overlook? How are managers and investors keeping up with a constantly changing world? How to best identify and profit from mega trends. How can FinTech help alternative investment managers and investors? Sunrise Capital's success story with Sliced Investing. Benefits and Benefits and limits of automation.